SPECTREOUTREACH.com: Lomography Adventure at KLPF 2011! 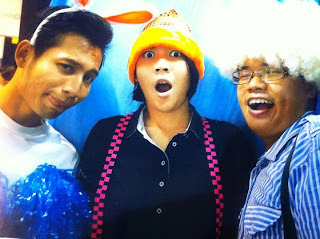 Lomography Adventure at KLPF 2011! The Kuala Lumpur Photography Festival 2011 is back ! it's Malaysia’s biggest and hottest imaging event with a combination of photography and travel elements. It is a gathering of the photography and travel fraternities with action packed programmes .Easily accessible at Mid Valley Exhibition Centre, Kuala Lumpur .A three-day event from 7th to 9th October 2011, plus big line up of who’s who speaker like Assada Porananond, Gary Friedman, Steve Chong, Marshall Ho, Joanne Hooi , Sze Yan & Lean Lee,Mohd.Azlan Mohd Latib, Raymond Wu, John Chong and etc. Even market leader of the photographic industry (Nikon, Olympus, Canon, Fuji, etc ) presenting their latest innovations in technology and designs at KLPAF2011! Any Amateur or Professional photographer will be tempted to come to the exhibition for latest tech, bargain or searching for new inspiration! Or perhaps just to satisfied a curious mind. I decided to use my recently bought La Sardina Camera with Flitz the Blitz flash in tow thus attracting lotsa curious onlooker and question . Using 35mm Colour Negative Film ISO 400 plus on bulb setting .The Lomography booth (Photocrafts) was particularly interesting and attracting lotsa photographer and stick out like small island sandwiched by booth selling latest camera and accessorizes plus endless sea of humans. I even took the opportunity to purchase film from the booth and pose with friends ( Feeq and Dania) that i meet there! Perhaps Analogue is the Future!